COMPACT RAIL features inductively hardened rails. This system is recommended for high processing speeds, long service life specifications, and noiseless running. 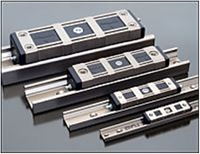 This linear motion guide-rail system is an easy, precision roller bearing solution that allows for rail mis-alignment in both out-of-parallel and out-of-plane conditions. 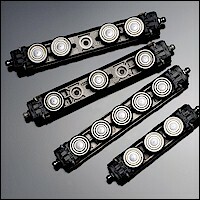 With the large rolling elements used inside the ROLLON COMPACT RAIL sliders, dirt and contamination are less of a problem than with that of recirculating-ball carriages. Since the COMPACT RAIL sliders run on an induction heat treated steel surface, they are able to move very fast, very quite, and with an extremely low coefficient of friction. The standard "NTE" style slider has a full body lateral seal, spring energized scrapers, and a felt wick reservoir at each end for complete self-lubrication. The easy preload setting for every COMPACT RAIL slider can be set according to the exact needs of the application so as to maintain stiffness and a low coefficient of friction. 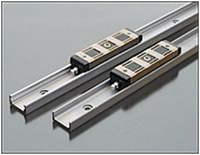 The ROLLON COMPACT RAIL linear guide-way has been engineered to allow for a substantial cost savings gained from the ease of mounting, while maintaining precision linear movements. With the choice between two types of master guide rails in parallel with the "U" follower rail, the COMPACT RAIL system is compliant with assembly mis-alignment. 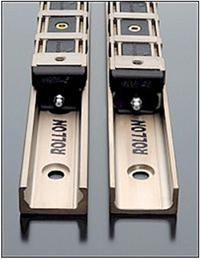 The ROLLON COMPACT RAIL linear guide-way system utilizes induction hardened raceways inside a single piece of carbon bearing steel rail. 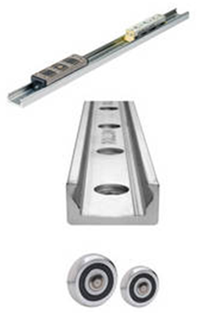 The standard rail is coated with an electrolytic zinc-plating for corrosion protection. For mounting flexibility each of the rail choices offer counter-sunk OR counter-bored mounting holes. The "T" style master guide-rail offers optimum lateral stability for the Compact sliders. The "K" style master guide-rail offers the ability for the Compact sliders to pivot +/- 2 degrees to comply with a less than square match up between the saddle and the rail mounting surface. The "U" style guide-rail with its flat profiled raceways allows the Compact sliders to follow one of the Master rails within 4mm out of parallel as well as out of plane. This compact slider body has 3 precision rollers running on opposed surfaces, the adjustable center roller sets the preload for the slider. This cast aluminum body has steel inserts for mounting, lateral seals, spring energized scrapers, and a felt wick reservoir good for 2 million cycles between lubrication intervals. This extended compact slider body has the engineered flexibility to use 3, 4, or 5 precision rollers running on opposed surfaces, the adjustable rollers set the preload for the slider. This cast aluminum body has steel inserts for mounting, lateral seals, spring energized scrapers, and a felt wick reservoir good for 2 million cycles between lubrication intervals. This steel slider body has the engineered flexibility to use 3, 4, 5 , or 6 precision rollers running on opposed surfaces, the adjustable rollers set the preload for the slider. The tapped mounting holes are 180 degrees from the rail mounting holes. The modified polyamide wipers serve as very aggressive scrappers for dirt and debris. This steel slider body has the engineered flexibility to use 3, 4, 5 , or 6 precision rollers running on opposed surfaces, the adjustable rollers set the preload for the slider. The tapped mounting holes are 90 degrees from the rail mounting holes and can be accessed from the top or bottom. The modified polyamide wipers serve as very aggressive scrappers for dirt and debris.